Explore who you are, what you want and how to get there in this innovative, engaging and empowering course. Are you in a work or life transition and wondering what's next? Perhaps you've recently graduated, been laid off, retired, divorced, or simply ready to make a change. This course is about you being real with you. Wayfinder is a self-directed online course with streaming video, fillable PDF downloads so you can work at your own pace and save your progress as you go, and includes a digital copy of the award-winning documentary film, One Week Job. There are 10 lessons, each with an introduction video of Sean Aiken discussing the theme. You’ll explore your greatest passions, your life purpose, values, strengths, why you do what you do, your unique definition of success, how to use fear as a tool to inspire action, and how to conduct informational interviews to land your dream job, to name a few. OPTIONAL ADD-ON: When you purchase the individual curriculum, you can add live one-on-one coaching sessions through Skype with Sean Aiken. One 30 minute session: $75. Three 30 minute sessions: $200. The intro video is approximately 3-6 minutes in length and features Sean Aiken introducing the theme of the lesson. For reference, the transcript is included at the start of each lesson in the Course Guide. Sample below. 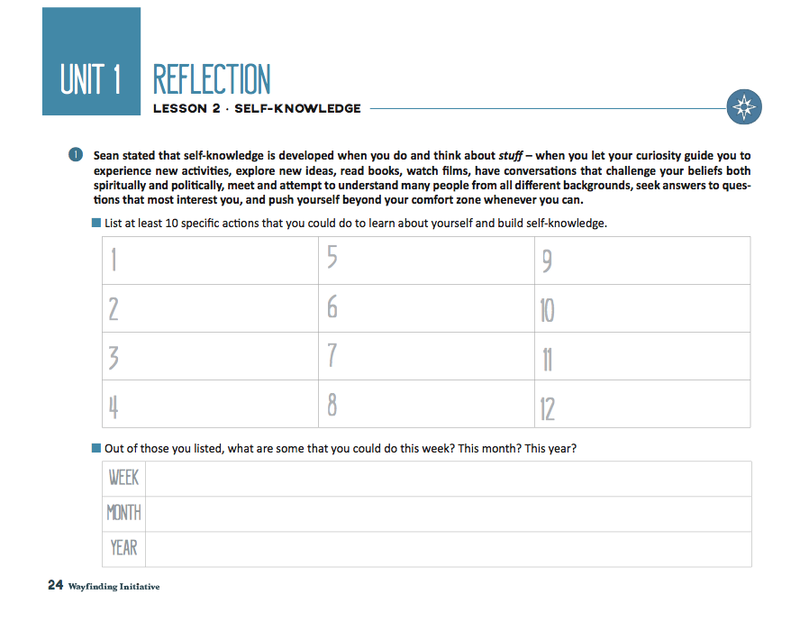 The reflection questions are designed to encourage inner reflection as they tend to be more personal and thought-provoking. In each lesson, an exercise is used to illustrate the theme. This is a chance to go further with the ideas of the lesson and to generate some practical takeaways. Following the exercise, there is a discussion section with further questions to answer individually or to prompt meaningful dialogue with a friend. At the end of each lesson, there are final thoughts that re-visit some of the more important ideas of each lesson. The predominant vision of success in our society is that the size of your bank account and the things you own become the standard by which you measure the value of your life. 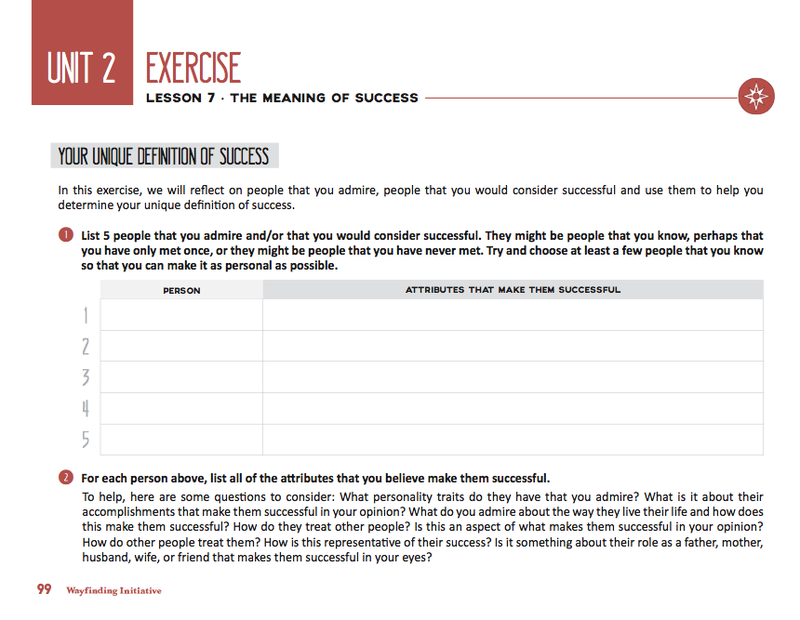 In this lesson, we’ll explore what it means to be truly successful and you will determine your unique definition of success. Download Lesson 7 for free here. UNIT 1 - WHO AM I? An introduction to the One-Week Job project and the themes explored in this course. Your success and fulfillment depend largely on self-knowledge - knowing who you are, what you’re good at, what you like to do, and why you do what you do. In this lesson you will identify your top values, strengths and weaknesses. Discover your top five passions and create the most powerful and succinct definition of your current life purpose - what you have come here to do and what drives your greatest passion. UNIT 2 - WHAT DO I WANT? In this lesson, you will design your ideal life. It will likely change over the years but having an idea of what your best life looks like provides enough direction to get started on making it happen today. 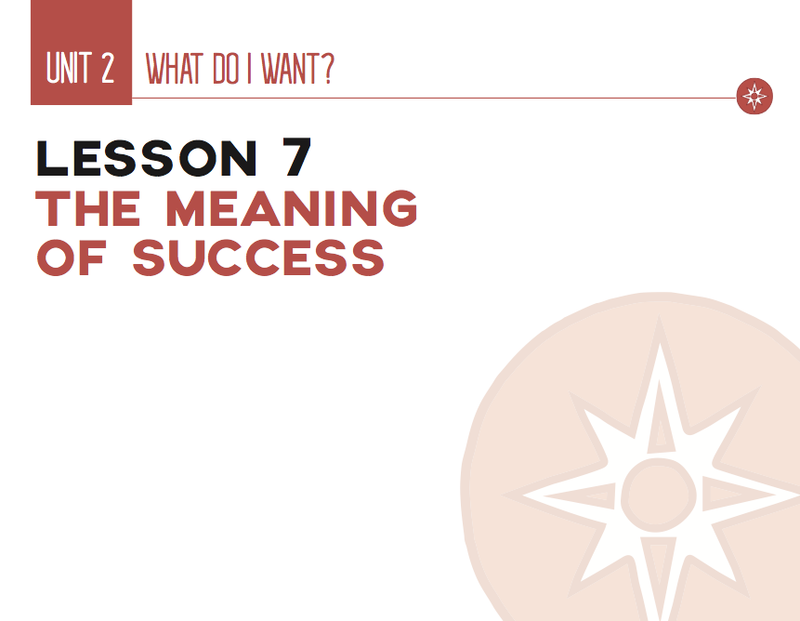 Lesson 6 - Find Your "Why"
The people who are most fulfilled in life know why they do what they do – they are connected to the meaning behind their choices or actions. In this lesson, you are going to find your “why”. UNIT 3 - WHAT IS THE FIRST STEP? In this lesson, you’re going to develop a list of careers you find interesting, perhaps even your dream jobs, and then research people in your community who currently hold these positions in order to conduct an informational interview. How often do you base your choices on fear? How often do you base your choices on what other people think? In this lesson we’ll explore how you can use fear as a tool instead of a compelling reason not to take action. There is an underlying belief in our society that your worthiness is not a given, that you must prove it, causing many to seek acceptance, validation, and permission. Permission to exist. In this lesson, you will uncover this false belief and create meaningful goals for the next five years. The people who are the most fulfilled in life all have a great understanding of who they are. They know what makes them happy, they know their values, their strengths, skills, unique gifts, passions, they know what’s important to them – then they make decisions about the life they want and how they want to make a contribution to the world based on this self-knowledge. Many people will go their entire life without examining who they are, what their purpose is, and how they want to make a contribution to the world. Think about it – this is your life. Don’t you think that a high priority on all of our lists should be determining what our life purpose is? Why we are here? And yet this is a conversation that rarely happens. Wayfinder is designed with this in mind and is focused on the development of self-knowledge, examining the questions "Who am I?" "What do I want?" and "What is the first step?" Wayfinder was designed by Sean Aiken in collaboration with educators, Dr. Michelle Jones, Lindsay Goodridge and Kristy Baker, and is a part of a larger collaborative project called The Wayfinding Initiative, a 501(c)(3) non-profit organization.